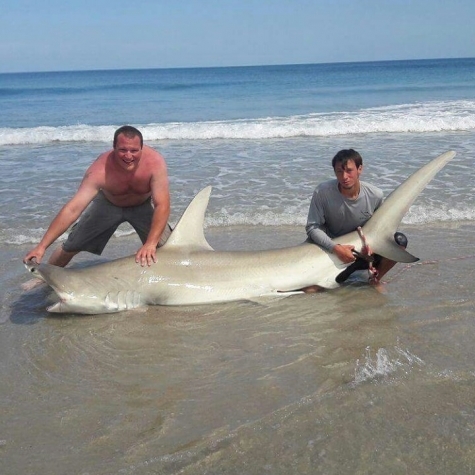 Shark Fishing on the Beach in Florida. Headed out bright and early last Thursday with some old friends I went to school with. They met up with me in hopes of hooking into some sharks or at least something that pulled a little drag. They are from Pennsylvania just like myselfborn and raised in Schuylkill County. I moved to the sunshine state after I graduated. Anyways it wasn't that long after we dropped baits that my 30 went off but it was a swing and a miss. I reeled in to check the bait and sent it back out to try again. Not even 30 minutes later it goes off again and I set the hook and passed the rod off to Kevin ( guy in photo) and he fights it having a blast on the avet 30 exw spooled with 80 lb bullbuster braid. She jumped about 4 or 5 times. After a 5 or so minute fight I leader the fish we got the hook out and took a couple pictures with his catch. "The last ray set out there for 8 hours if not more got picked up and I hooked into it"
The rest of the day went on pretty slow not much happened till sunset. We had our first big bait get hit first was for sure a hammerhead but spit the hook. Second fish was either a big bull or tiger hint it cut # 19single strand wire. So about 2 minutes after hook up, both were hooked on rays, then right about dark the last ray set out there for 8 hours if not more got picked up and I hooked into it. Definitely got a hook in it that time past the rod off so I could harness up got ready to fight was putting rod in the harness when it went slack. Pretty sure sure that a blacktip ran into my line while I was hooked up to something decent. Wouldn't be the first time and that was the end of our trip. If you are in the market for Bullbuster line use TEAM REEL DEAL promo code CJONE to get 10% off your order. Stay tight my friends . If you enjoyed this article check out this hammerhead article below. "A boat decided to to drive right beyond the breakers so I headed out on the kayak to tell him to drive further out"
All was quite for a while and around 11 am we finally get another run and it's another hammerhead. Just steadily pulling drag. 45 min into the fight a boat decided to to drive right beyond the breakers so I headed out on the kayak to tell him to drive further out... Read More. This is an old picture, we now make sure to keep our hammerheads fully in the water.